The walking stick is an insect that resembles a stick or a twig with very long legs. Its shape serves as a form of protection from predators. In recent times walking sticks have been classified in their own special order called Phasmida. There are only about a dozen different species of walking sticks. We were not able to be 100% sure of the identification of this particular walking stick, but we believe it is an eastern walking stick, which is characterized by its very slender body. In this photo, its shadow is more noticeable than the walking stick. 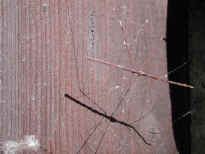 The eastern walking stick is about two to three inches long. This one was only one inch long. 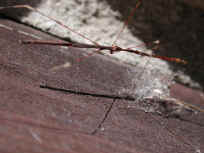 We spotted this walking stick on the frame of our garage door. It was difficult taking these pictures, because the walking stick kept walking, causing its legs to blur. An example of this blurring is evident in a portion of the right rear leg (left center of photo). 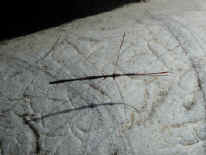 This walking stick walked only on four of its six legs, while holding the two forelegs straight out in front (right side of photo). As this walking stick continued walking, it climbed onto the stone exterior of our home, where we were able to take this photo with greater contrast. The four walking legs are each about twice the length of the body, while the forelegs (held out in front) are much shorter. This particular walking stick appears to have lost about two-thirds of its right antenna. Walking sticks eat green tree leaves. In this enlargement of the first walking stick photo, we can get a better look at its body and head structure with its two forelegs held out in front. 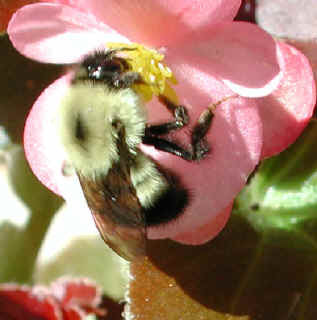 The two compound eyes can be seen on the sides of the head, just behind the antenna. The literature says that walking sticks have no wings, but this one has what may be wing sockets on the back over the middle set of legs, and what appear to be small wings folded back along its body.